Is It Good News? Is It Really, After All This Time, Good News? Nonfarm payroll employment increased by 192,000 in February, and the unemployment rate was little changed at 8.9 percent, the U.S. Bureau of Labor Statistics reported today. It should be noted that today’s report revised upwards the number of jobs for both December and January to 152,000 from 121,000 and to 63,000 from 36,000, respectively. Obviously, it’s good news that there were actually 58,000 more jobs created during these two months combined than we thought. Those 192,000 net new jobs in February according to BLS’s Establishment survey aren’t far off the 250,000 estimated by its Household survey. There was a major discrepancy last month: these surveys estimated 36,000 and 589,000 jobs created, respectively. It’s nice to see these two surveys’ statistics a little closer together in February, as it provides better credibility to the numbers we’re seeing. Private sector jobs did much better than government jobs in February. Firms added 222,000, while state and local jobs declined by 30,000. Federal jobs were unchanged. Since a recent low in February 2010, total payroll employment has grown by 1.3 million, or an average of 106,000 per month. The really good news in this report is that it’s looking increasingly as though the sharp drop in the unemployment rate over December and January, when it fell from 9.8% to 9.0% in two months, is less of an aberration than it might seem. The 8.9% rate, while undeniably unacceptably high, is the first time we’ve seen an 8 handle on this figure in almost two years. And remember that in October 2009, the number was 10.1%. Even the worst news of the report, in table A-12, is something of a statistical aberration: while the mean duration of unemployment hit an atrocious new high of 37.1 weeks, that’s mainly because the upper bound for for unemployment duration was changed this year to 5 years from 2 years. The median duration fell, to 21.2 weeks. There’s still an American underclass of about 2.5 million long-term unemployed, but it does seem to be shrinking a little. The most important thing for not only the economy, but also the long-term deficit, is that we get unemployment down, and fast. When businesses begin hiring again, that’ll mean more revenue rushing into state and federal coffers, it’ll mean gains in the stock market, it’ll mean lower social spending through programs like Medicaid and unemployment insurance. Sharp spending cuts may save us some money, but that doesn’t mean they’re a good deal, at least right now. What we need at the moment is more jobs reports like this one — businesses need to be convinced that this is a recovery, not merely a good month. Anything that might get in the way should wait until we’ve had a few of them in a row. There are caveats, of course. 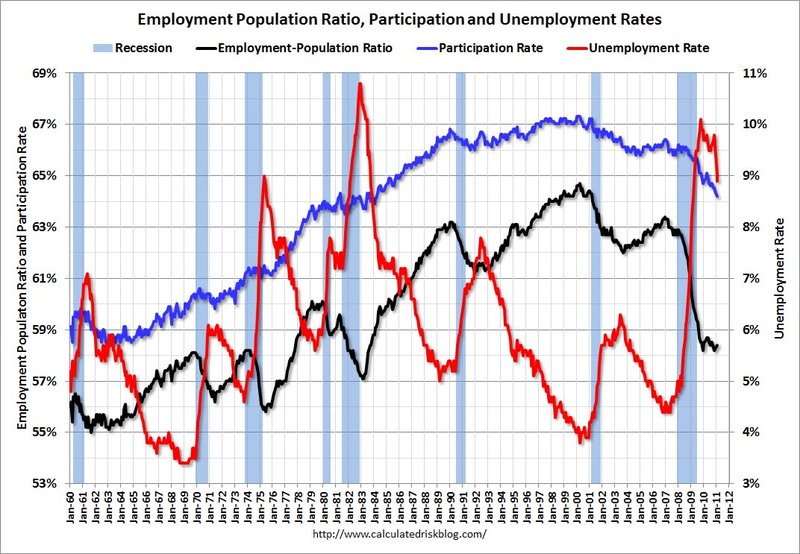 There are still millions of people sitting outside the labor force after the recession, and returning them to full employment is going to be a difficult, if not impossible, task to achieve The rising price of oil, brought on by the myriad crises in the Middle East, could put a damper on any economic recovery we’re experiencing right now. And, of course, this could all be a one month anomaly. Nonetheless, this is good news and let’s hope it continues.